When we had Ruby, we registered for a simple, brown diaper bag. I wanted something Jeff could carry and not be embarrassed and neutral enough to reuse if our next child was a boy. It's been a good diaper bag, with lots of pockets and such, but it's time for something with more style. Yes, Ruby is still in diapers, how does a work at home mom find time to potty train?! Even if she wasn't, you always need a spare change of clothes and snacks for toddlers. I come across these retro luggage bags all the time and I don't know why I never thought of using it as a diaper bag. This "Ruby" red one is perfect and I just washed the brown one, so it is set to be donated. 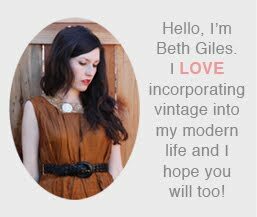 I love that I don't have to feel bad replacing a perfectly useable item when I buy something vintage, it's like an even exchange. I like the new "old" red bag! But I also like the brown one too! The brown one looks more like a purse than a diaper bag! I just found your blog via The Pleated Poppy. I am also looking at ways to bring in the OLD and get rid of new (mostly plastic) things. But I really smiled when I read your diaper bag post - I had the same diaper bag! I only used it a few months and was ready for something else. Looking forward to following your blog!